Retired Mesa Police Officer Tom Gaupel & Heidi Gaupel, open PROTEINHOUSE, Healthy Fit Kitchen with Karey Northington, in Gilbert, AZ. 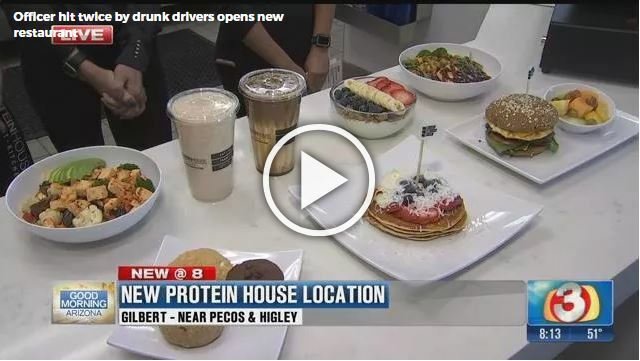 (3TV/CBS 5) -Retired Mesa Police Officer Tom Gaupel, who sustained serious injuries after he was struck by two different drunk drivers while on duty for DUI Patrols, opens a new healthy restaurant in Gilbert called “Protein House, Healthy Fit Kitchen.” He credits healthy habits and fitness for helping him to recover from his injuries. Now he wants to share that with others by opening this new restaurant.